I have a couple beautiful ZuluGrass necklace strands to give away. And yes these necklaces are really made from grass and glass beads on a stretchy elastic string. The necklaces can be worn as bracelets, anklets, belts, hair accessories and more. To find out how to get a free ZuluGrass necklace keep reading. Zulugrass Jewelry is made by the Masaai women of Kenya and sold through the Leakey Collection. The Leakey’s have created thousands of jobs in non-factory settings for the Masaai women in the Kenya area who make the jewelry using tradtional methods using grass and wood found in the area. Zulugrass is made from African grass that is harvested by hand and each bead is cut from the grass strands, the beads are waterproof and are dyed in a wide variety of colors. 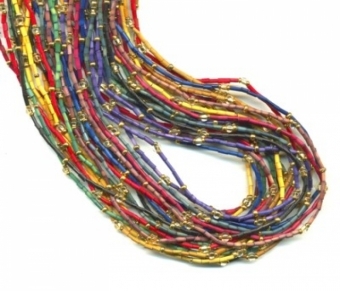 The beads are strung onto heavy duty elastic and hand blown glass beads are added to create beautiful jewelry that is versatile, colorful and eco-friendly. To win your free strand just leave a comment and make sure your contact info is available so you can be emailed if you are chosen as a winner. There will be four winners. I will choose the winners next Tuesday on June 2. These are absolutely beautiful — I’d love to wear one 🙂 *Thanks* for the giveaway! I’m sure i could find a few lucky ladies to take these off my hands. These are gorgeous! I’d love to wear one in my hair! These are beautiful. I spent time last summer in Tanzania and have a paper bead necklace that I love. The Masai women create amazing jewelery! Those look so awesome! I would love to wear one and tell everyone about them & tell everyone about it on my blog! The jewelry of the Leakey collection is simple and beautiful. That is so lovely! I love the versatility also. these are the type stories i love to hear. thanks for the giveaway. its a prize worth winning! Awesome giveaway. These are beautiful. I don’t see how they are handmade. Nothing like wearing something beautiful that has meaning. Thumbs up! Those are beautiful! I would be delighted to wear one. Very cool, I would wear it with pride. i love those vivid colours! I bet my mom would love one! Love this jewelry! Very festive, and I love that they are made from natural materials. I have painted with grass, mud, and flowers. these are gorgeous! thanks for a great giveaway! My grown daughters would each want to have their turn to borrow it – SO beautiful!! These necklaces are wonderful! I like that they are made from grass, by hand. I love everything as natural as possible. I’d be thrilled to win and wear one! Gorgeous! I’d love a chance at winning this. I love the Leakey Collection!!! It’s beautiful, ecofriendly, and it’s made by amazing women! Beautiful! I would love to have one. Thank you! These are really gorgeous and right up my alley. I’m always on the watch for unique, handmade, fairly acquired jewelry items! Thank you for this giveaway! Love the necklaces. Always looking for something cute and eco-friendly! Glass & Grass—what a Blast! Just “roll” my way, & make it Fast! I have tried these on and they lift the spirit just having them on. What a great story of success for the woman in Africa who make and sell them. thanx for the opportunity to try my luck. Beautiful necklaces. Are the women that work in the factory able to support their children to get better education and health care? I applaud these great efforts to make life better for those that have talents and can share them and in kind support their families! Fabulous! The contest is now closed, winners have been chosen. Thank you all for entering. Grass Zulu Beads make me feel happy. I love to think about the African women who make them! Thanks. Oh! These are beautiful. God bless the Masai women who make them. I have a single strand of these beads and am really curious to know what the scientific name of this grass is. Also, what makes the grass so hard, is it silicates? Thanks for helping to make human habits more diverse and sustainable.